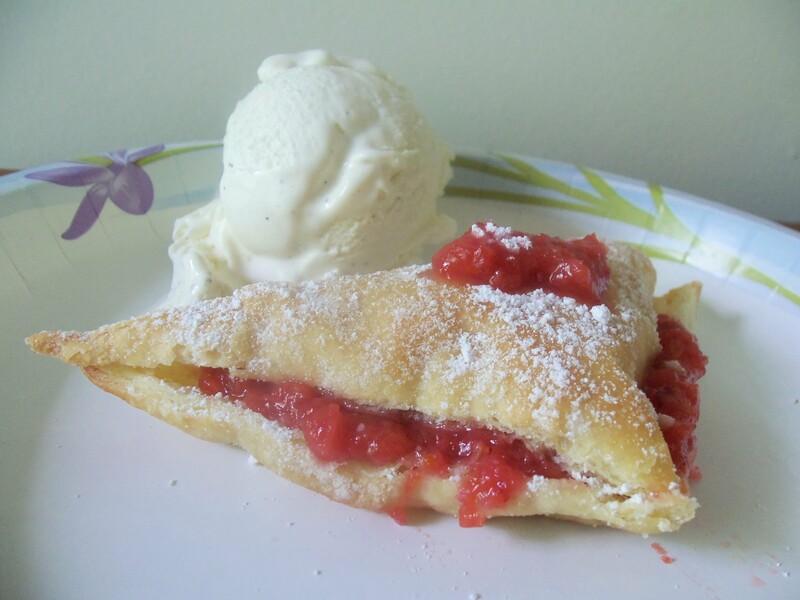 As promised last week, here is the strawberry-rhubarb napoleons that I made for Easter dinner! The rolls and these napoleons made me much more confident in my baking so hopefully there will be more of these yummy treats to come! I’ve been in the south now for 3 years, and I have never had a rhubarb before. Talking to other people, they seemed to LOVE rhubarb everything. So I decided to try it out for a nice spring taste. It came out delicious, and I was able to make it the day before which helped since I had a lot of other things I had to cook on Sunday. Keep reading to get this delicious recipe! (1) Preheat oven to 400 degrees. Line a baking sheet with parchment paper. Unfold the pastry sheet on your work surface (If the pastry sticks a bit, dust lightly with some flour) Roll the dough out to about a 10-inch square. (Use a ruler and a pizza cutter or a knife to make sure that the pastry is 10 inches by 10 inches. This will help make sure that all your pastry triangles will be even) Using the ruler and the cutter/knife, cut the square into 4 even square. Then cut those in half to make 8 triangles. 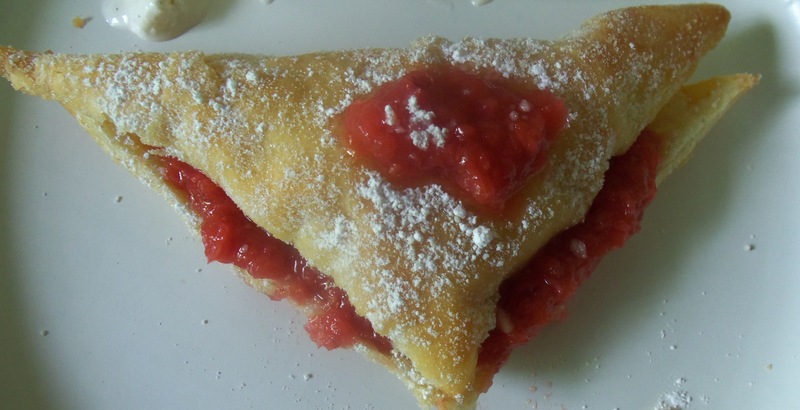 (2) Evenly sprinkle the triangles with about 2 tablespoons of sugar. Put the triangles, sugar side up, on the baking sheet. Bake until nicely puffed and golden brown, about 12 minutes. (The original recipe said to bake for 25 minutes. Trust me this is wayyyyy too long! I thought it was weird, but tried it anyways. Before twenty minutes had even passed the pastries were so burnt and smokey.) Let the triangles cool, and then slice each triangle in half to make two triangles. (These can be made a day in advance. Store in an airtight container at room temperature). (3) Now for the filling, whisk the sugar and cornstarch in a small bowl, making sure there are NO lumps. Cut the rhubarb into small slices (about ½ inch). Add rhubarb, sugar mixture, orange zest, orange juice and the strawberries to a saucepan. Stir and mix well and let sit for about 15 minutes off of the heat until it gets juicy. (4) Put the pan over medium heat and let cook until the rhubarb is tender, but still holds it shape stirring occasionally (about 7 minutes). Let this mixture cool for about 15 minutes. Place in a food processor and blend until still chunky but rhubarb isn’t too thick. DO NOT process too long. You don’t want it to be too smooth. (These can also be made a day in advance by covering and refrigerating. If you do refrigerate, make sure you heat up the filling before placing it on your pastries). (5) Put a half triangle on a serving plate. Spread filling, then top with another triangle. Repeat until each Napoleon has four layers. (Mine only had one layer, because of the 25-minute baking incident). Sprinkle with powdered sugar and serve with extra sauce on the side. Top with ice cream and serve immediately. Could I sub an egg for the cornstarch? It works the other way around (cs for egg). That’s a great question. I personally haven’t tried substituting eggs instead of cornstarch in the recipe. I know in some recipes you can use cornstarch instead of eggs, but I’d be careful about that too. If you are making a cake, you want to try to use eggs if possible to keep it light and fluffy. BUT if you want to make this recipe, and not go out an buy cornstarch, you can substitute it with regular all-purpose flour. For every 1 tablespoon of cornstarch, use 2 tablespoons of all-purpose flour. I’ll keep searching for an answer to your question, and if I found out a better answer I’ll let you know! These look so good because I love rhubarb! My grandmother would make pies and introduced me to this wonderful food. I will be posting later this week about some rhubarb jam I made. Hope you will visit. I will definitely keep a look out for the jam recipe! Thanks for reading.